Is Richard Branson Hearing Footsteps? 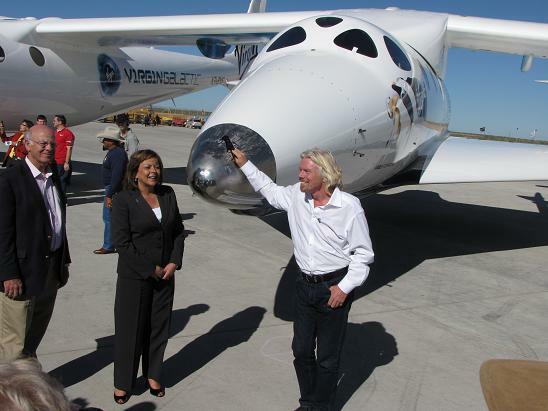 Unless Hugo Chavez has some secret space plane project that only he and Branson know about, this could only be a reference to Space Expedition Curacao, which plans to begin commercial suborbital space tourism flights from the Caribbean island using XCOR’s Lynx vehicle sometime in 2014. Those flights will actually cost $95,000 per seat, but close enough. I don’t know if Branson obliquely mentioned his competitor on his own, which I’ve never heard him do publicly before, or whether this was simply a response to a specific question from the press. Context is hard to judge if you’re not there. For example, the big headline out of Lori Garver’s talk here in Las Cruces was the “pay now or pay later” regarding commercial crew and Soyuz flights. It wasn’t really the subject of her talk and came in response to a question from me about the adequacy of the commercial crew budget. But, it was her most newsworthy comment, so that became the story line. Branson’s comments do seem to be part of a larger strategy. In a speech during the official press conference in which no one took any press questions, Virgin Galactic CEO and President George Whitesides stressed that the company is the only suborbital human spaceflight provider with a vehicle in flight testing and is the closest to launching commercial operations. Whitesides never mentioned XCOR, but he sought to point out that Virgin Galactic is ahead in the game. Whitesides also pointed out the substantial progress in both flight testing and ground facilities that have taken place over the past year, including SpaceShipTwo glide flights, the opening of The Spaceship Company’s production facility in Mojave, and progress at Spaceport America. That progress can get overlooked amid questions over development delays and the status of SpaceShipTwo’s hybrid engine. The 8-person space plane has had 16 glide flights thus far, including a hair-raising one at the end of September. The schedule is to begin powered test flights by the end of second quarter 2012 (June 30). Flights into space would follow after lower altitude tests. Branson wasn’t making any predictions this week on when commercial flights would begin, which was a wise move that he hasn’t always made. Meanwhile, the gap between Virgin Galactic’s $400 million space plane project and XOR’s vastly smaller and more modestly-funded Lynx project has been closing. After many years of struggles, XCOR has both a firm design and enough money to build the first prototype of the two-seat vehicle. The company is aiming for the first flight — a short hop off the runway — by late Fall 2012. A full test program would follow with the vehicle reaching an altitude of about 61 kilometers; a production Lynx would follow that would be capable of reaching 100 kilometers, which is considered to be the boundary of space. Commercial service is due to begin out of Curacao in 2014. There is skepticism outside the company on whether XCOR will be able to build and fly the first Lynx by the end of next year. XCOR reps expressed confidence in the schedule but acknowledged that they have a lot of work to do. And there’s a bit less pressure on them. Being a much lower profile project, XCOR is not under the same harsh public spotlight as Virgin Galactic. And although they would love for Lynx to beat SpaceShipTwo to the first powered flight and even commercial service, they’re going take the time they need to get it right. It will be interesting to see what happens next year. The prospects of not one but two suborbital passenger vehicle making powered flights over Mojave is exciting. If Masten, Armadillo and Blue Origin are also doing high-altitude flights next year, then suborbital spaceflight will have finally arrive. And that would be awesome! I can hardly wait. If I was Virgin Galactic, I’d actually be more worried about competition from SpaceX. If Musk has his way orbital trips may come down to within an order of magnitude of a suborbital hop. VG has an airframe being flight-tested, but no engine and no engine experience. XCOR have an engine ground-tested, but no airframe and no airframe experience. Be interesting to see which philosophy wins out. Is it easier for a rocket company to built aircraft, or easier for an aircraft company to build rockets. To Polynonymous, SpaceX will not get the second stage re-usable for many years so they will not be in the same cost bracket for some time. Once VG have paid for the developement costs they will be able to reduce flight costs substantially to move into the cheaper well-off market rather than the rich joy-rider. But I do agree that SpaceX will get people to orbit and take out the super-rich adventurer market cutting VG margins and forcing them into a lower cost market sooner than they would like. Though if VG schedule for rocket tests slips as much as the flight test schedule has then SpaceX may get paying passengers to orbit sooner than Virgin gets paying passengers to sub-orbital flight. Not that it will change the VG business case that much untill Falcon 9 is fully re-usable to reduce the costs down from the 10’s million per seat to the sub million per seat.